I am fortunate to now be a Brand Ambassador for Thunderbird Bar. I am careful when selecting the few packaged foods that I eat. Thunderbird Bar is a whole food bar made of single ingredients I understand and can pronounce. They are all 100% all natural using fruit, nuts, seeds and spices with no added sugars or anything artificial. They are all fully plant-based and tasty! For 15% off your order use the code “runningtheparks” when you check out at thunderbirdbar.com. I am now a Brand Ambassador for Footbeat. Many of you know I have chronic plantar fasciitis (PF). Footbeat is a recovery tool for PF and other conditions by providing a therapeutic massage that reduces pain and increases the body’s circulation through precise, cyclic pressure on the bottom of the foot. This proven method helps users achieve the natural circulatory benefits of walking during periods of immobility. Increased circulation revitalizes muscles and eases pain which improves health and athletic performance. The recovery phase allows the body time to heal, leading to less injuries, more training and improved performance. The most effective form of recovery is active recovery. The objective of active recovery is to maintain sufficient blood flow, supporting your body’s natural ability to heal. Footbeat is active recovery. I have found that if used consistently it reduces my PF symptoms and just makes my feet feel good. Read more at Footbeat.com. If you are interested in a pair for your feet use the code "bill50" at checkout for $50.00 off your order. I am honored to be a Brand Ambassador for Teatulia Organic Teas. Teatulia’s single-garden direct, sustainably grown teas hail from their very own tea garden in the Tetulia region of Northern Bangladesh. By controlling the entire supply chain Teatulia can ensure their product is organic and clean, their growing, packaging and shipping practices sustainable and their actions make a difference in the lives of their employees. The company is a certified B-Corporation and Rainforest Alliance Certified. In addition, their teas regularly win awards for taste. When plants are grown in a clean and naturally managed way the result is better taste and better health. Learn more about the benefits of tea, the different types of tea and proper preparation on their web site at teatulia.com. I am a Brand Ambassador for Hammer Nutrition. They produce very high quality all natural products for fueling, hydration and recovery. I've been using Hammer since at least 2008. On my marathon runs in the parks I carry exclusively all natural Hammer Gels and either Perpeteum or Endruolytes Fizz in my bottles. I also use Endurolytes electrolyte replacement when it is really hot. These products and many others across their product categories are vegan. Hammer Nutrition's customer service is outstanding. It is really some of the best I've encountered of any company in a long time. It keeps me coming back. 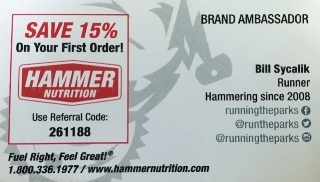 You can use my referral code 261188 when checking out at hammernutrition.com for 15% off of your first order. Gnarly Nutrition is all about going big and reaching for true potential. Their goal is to build sports nutrition that is natural, clean, and great-tasting supporting athletes to "want more, do more and be more". I became a Brand Ambassador for Gnarly Nutrition in 2016. I'm a regular user of their Gnarly Vegan Feast and Gnarly BCAAs allowing me to recover and repeat. Gnarly Vegan Feast is easily and by far the best tasting protein supplement I've ever tasted. Go to gognarly.com and get 15% of any order using the code "runningtheparks". 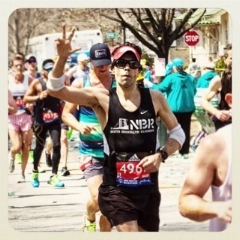 I recently became a Brand Ambassador for Running Buddy. When I go out for runs where I don't carry my hydration pack I found it a juggling act to carry some nutrition, my iPhone, ID, money and keys. That's where the Running Buddy Buddy Pouch has come in very handy. The lightweight Buddy Pouch is a beltless, chafe and bounce-free pouch with a water-resistant inner pocket using magnets to attach to your shorts or tights. Made with dri-fit and water-resistant fabrics, the Buddy Pouch keeps your items sweat-free and dry. In my experience it does not move around, provides easy access to my phone for pictures while leaving my hands free. Things have stayed dry even in warm weather. No more carrying your phone and other gear in a plastic bag. The Buddy Pouch comes in multiple sizes fitting many phone types and colors fitting many personal tastes. Check out the Buddy Pouch and other great products at therunningbuddy.com. I love the Trigger Point foam rollers and other massage tools. I've used the GRID, GRID 2.0 and GRID STX Foam Rollers and the MBX Massage Ball. They really help me work out the kinks both from running a marathon a week and more importantly from sitting long hours behind the wheel as I drive from park to park. 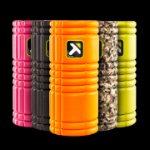 Check out their wide array of recovery and maintenance products and instructional videos at www.tptherapy.com. I was gifted my first pair of Balega socks and they quickly became favorites in the rotation. I now run almost exclusively Balega. I have the Hidden Contour, Ultralight No Show and Blister Resist Quarter. Find your pair at www.balega.com. As you would think I will be camping quite a bit during my trip. However I will not be staying in just any only tent on the ground, oh, no, no, no. I will be riding high in a rooftop tent from Tepui Tents. What is a rooftop tent you ask? It is a permanent tent attached to the roof rack that you climb into via a ladder. Pretty slick. I will be up off of the ground and away from critters, water, roots, rocks, and other things uncomfortable. I've made this investment because I do need some degree of comfort to allow my body to recover after the marathons and I expect I will use it a lot once I've settled out west. I am an avid podcast listener and music fan. I'm a huge proponent of Jaybird Sport's wireless earbuds. They just work. While I do not listen to music when on the marathons in the National Parks I get plenty of miles out of my X2s in the car, in coffee shops, short runs and other workouts. The music quality and phone quality are both fabulous. Going hands and wires free makes it really easy to catch up with friends while I'm on long car rides across the country. Pick out your perfect buds at jaybirdsport.com. I use a GoPro Hero4 Silver to capture my experience running at a National Park. I carry it mounted on a GoPro 3-Way which can act as a handheld, extension arm and tripod. I've recently been upgraded to a Hero5 Black with lots of fun features including image stabilization which will really help smooth things out when running. Check out the Hero5 Black and the 3-Way and #BeAHero. UltraU is the official coach of the National Parks Marathon Project. Dana Katz brings a unique blend of passion and relentless optimism to her coaching. While her programs are tailored for each individual they hold fast to the basic tenets of UltraU: setting goals, working hard, pushing through setbacks and knowing the immense satisfaction that comes with achievement. I want to thank the team at Patagonia SoHo New York City for being a friend of the National Parks Marathon Project. They have very deep product knowledge and provided a lot of excellent suggestions for preparing me for this trip. They were one of the first to believe in my dream and for that I am grateful. Are you looking for an opportunity to have your product featured at every National Park in the country? Want to see it truly field tested? Want to see it featured in blog posts, videos and social media? Contact me at runningtheparks@gmail.com and let's talk.